We build our homes with Douglas Fir Logs. Our logs are handpicked. We only use full length logs with the highest grade and strength. Each log is hand peeled using a traditional drawknife. 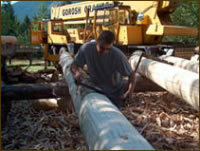 Our skilled builders cut, fit, scribe and notch each log. An environmentally friendly mould control is used to a minumal amount to maintain log quality during the building process. The most common notch we use is the saddle notchwhich offers a tight fit to prevent rot deterioration and moisture build up. A groove is cut on the underside of the log where insulation is placed between each log. This prevents the need for chinking as there is a weather tight fit. Window and door openings are cut to your preference. You can choose from a straight cut to a flared design. We construct roof systems consisting of ridge, purlins and posts. Holes for the thru bolts, screw jacks and electrical boxes are drilled. We also construct log stairs and railings. Once the log shell of your home is completed the beautification process begins with fine sanding of log ends, window cutouts and archways. Once sanding is completed the home is stained with a product chosen by the purchaser. The purchaser is responsible for paying for the cost of the stain product, however, the cost of staining the logs in included with the price of the log package. Once two coats of stain have been applied each log is individually numbered and the logs are loaded onto a transport truck, or placed in a container for shipping. Our experienced builders will be sent to your job site to reassemble your home. The length of time to build your home will depend on the size of your home. On average the process will take between 6-8 weeks for the log work and another 1 – 4 days to assemle your home on your job site. 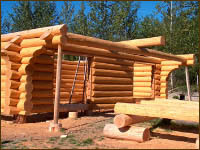 Kingfisher Log Homes is experienced in finishing log homes from the ground up. Therefore once you home is reassembled on your job site we will be available to you to answer questions or concerns you have with respect to finishing your home, at an hourly cost, as finishing a log home is extrememly different from finishing a traditional framed home.